Album: “Motown Hitsville, USA”, Volume 1, disco 4. "Ball of Confusion (That's What the World is Today)" is a 1970 hit single for the Gordy (Motown) label, recorded by The Temptations and produced by Norman Whitfield. Like "Psychedelic Shack" before it, "Ball of Confusion" delves head-on into psychedelia, this time with a strong political message. The lyrics list a multitude of problems that were tearing the world apart in 1970: the Vietnam War, segregation, white flight, drug abuse, crooked politicians, and more. "Round and around and around we go", the Temptations sing, "where the world's headed/nobody knows." 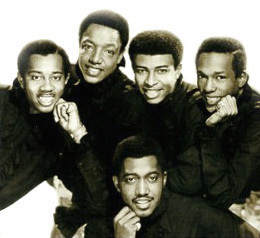 The end of each section of the Temptations' lists of woes is pucntuated by bass singer Melvin Franklin's line, "And the band played on." "Ball of Confusion's" lyrics are delivered over an up-tempo instrumental track with two drum tracks (one for each stereo channel), multitracked wah-wah guitars, and an ominous bassline by Funk Brother Bob Babbitt that opens the song. Norman Whitfield's dramatic count-in, always recorded at the very start of a recording for synching purposes only, was left in the mix for this record. Despite its strong political themes, the record consciously avoids implying a definitive point-of-view or a defiant stance. This is because the Temptations song "War", which Norman Whitfield intended as a spring 1970 single release, was not released because Motown felt the song's forward message could alienate more conservative listeners. Whitfield took "War" and reworked it as a single for Gordy solo artist Edwin Starr (for whom it became a number-one hit), while he and lyricist Barrett Strong wrote the more subtle "Ball of Confusion" for the Temptations. When they first saw the sheet music for the song, The Temptations didn't think they would be able to pull off the rapid-fire delivery required for the song. Lead singer Dennis Edwards had the quickest tongue in the group, and was assigned to deliver the more difficult lines in the song. 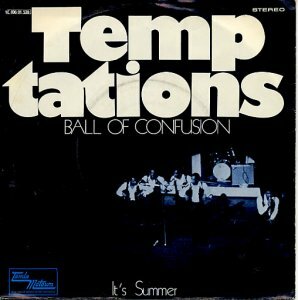 "Ball of Confusion" is among the Temptations' most covered songs, with versions by Tina Turner, Love and Rockets, Duran Duran, and Anthrax, among others. It was used to anchor the 1970 Greatest Hits, Vol. 2 LP. The song reached #3 on the US pop charts and #2 on the US R&B charts. * "GoogaMooga" è il padreterno; come esclamazione, "great GoogaMooga" corrisponde sia all'italiano "sant'Iddio", "Dio santo", ma può indicare anche grande stupore frammisto a indignazione. Sulla storia e sull'origine dell'espressione si veda questa pagina. ** Ovvia la citazione della canzone più famosa di Barry McGuire, Eve Of Destruction.